Hello, Rabbi. It’s been awhile. Sorry I haven’t kept in touch. A girl gets pretty busy after she gets her driver’s license. Oh, and those high holiday services I've missed for the past few decades? Whoops. My bad. Guess I figured I could atone alone. It's not too late to get in on the action, is it? So Rabbi, here's the spiel. After going for a few months without meat, I had been toying with the idea of declaring myself a vegetarian. Not in a press conference or anything, but if someone should ask. Then the unthinkable happened. 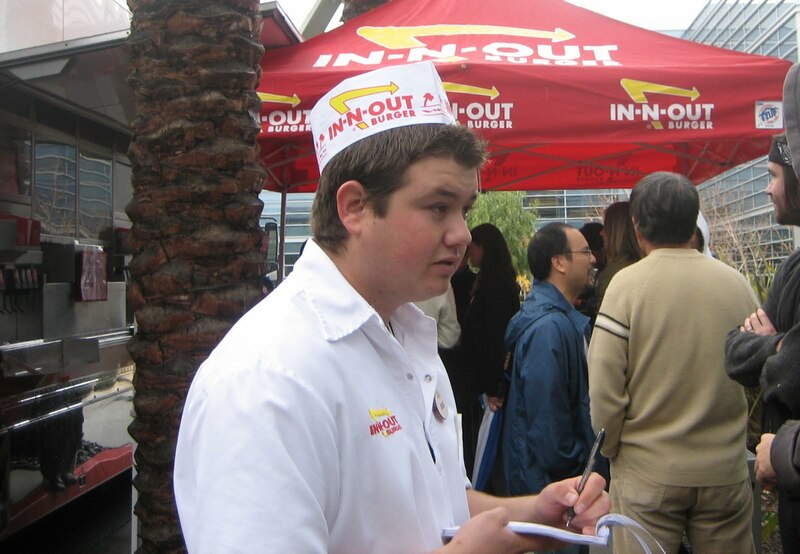 My company announced the In-N-Out Burger truck would be coming to our office. Yes, free junk food for all. 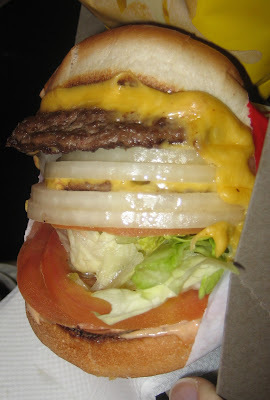 Apparently they thought the Double-Double would be a little somethin’ somethin’ for the holidays. From my experience, one somethin’ is usually enough. In-N-Out would also be making “grilled cheese.” In other words, a cheeseburger without the burger. That’s like Fran Drescher without the whine. What’s the point? 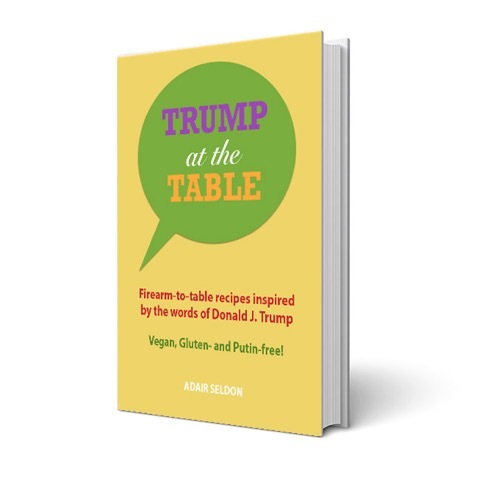 A slab of melted American cheese lying limply on sliced tomato, onion and “hand-leafed" iceberg lettuce on a grilled “sponge dough” white bun slathered with sauce? Sounded like a lotta nothin' nothin' to me. Hell, I figured I might as well call in sick that day. I always loved In-N-Out burgers, and though I hadn’t eaten much meat or even craved it in the past year, the power of suggestion got my brain salivating. The things In-N-Out did with just a few ingredients to create the perfect mouthwatering alchemic reaction was always a mystery to me (but I was never very good in alchemy). So I discussed next week's truck visit with my vegan friend at work, and you know what she said? “You should have a burger if you want one. It’s a treat.” Did you hear that, Rabbi? A treat! I had a vegan’s permission to eat a sentient being! And I had just gotten a blood test back from the doctor that said I had slight anemia, so maybe I needed this. I had a doctor’s note and a vegan’s note! I felt a higher power summoning me to this sandwich. As far as I was concerned, I had been touched by the carnivorous hand of god. I had carte blanche to go hog wild. Oh, sorry about that hog reference, Rabbi. For days I fantasized about that bovine bad boy. The mere thought of a grilled patty (I would have a single) and melty cheese nestling with peppy onion, tomato and crisp, plebeian lettuce between two crunchy, precisely sauced counterparts raised my serotonin. Sure, I still had some moral qualms, but in the sinning department I was no Jerry Sandusky. I would never be caught canoodling tender, young calves in the barn and coercing them into my scaloppini. I haven’t scaloppinied in 30 years. Veal is where I draw the line. My cow would be of consensual age. Although I doubt he'd be giving me the “hooves up” sign. Yes, Rabbi, I would eat cheese and meat together, and unkosher meat at that. But as the big day got closer, I started wondering about my cow. Would Bo be one of those happy cows from California like in the cheese commercials? Would he be the George Hamilton of bovines with a tanned hide from hours spent luxuriating in an open pasture? Did he eat well on all that bountiful green grass or was he forced to subsist on a junk-food diet of GMO corn? On the morning of my big day with Bo, I decided to do a little research into his provenance. Turns out my bovine bad boy would be coming from Harris Ranch—that huge feedlot you can smell on the freeway, midway between LA and San Francisco that's crammed with cattle. Rabbi, do you know what they call that place? Cowschwitz. I would be eating a concentration camp cow. I have been to the real Auschwitz in Poland, and can I tell you something? It was not pretty. But I don't have to tell you. So the thought of Bo and his family living in holocaustic conditions at Cowschwitz, subsiding on GMO corn nagged at me. And I only had a few hours left before the In-N-Out truck would arrive. the suspense is kiling me! hhhaaa lol, totally thought of you driving by in and out! Hurry up with the next installment! Be careful, In-N-Out is a gateway burger that can lead to more serious ones like Umami, The Counter, or Short Order. Got several good laughs with this post. Excellent. No In-N-Out in Denver but still eagerly awaiting part 2. How could you leave us hanging like that??? You took a photo of a huge burger...Was it someone else's? Or was it yours? Did you eat it? Or were you actually unable to take that first bite? COME ON!! You're frickin' hilarious! hog wild, meat & cheese together, oy vay! Now that I know In' Out's beef is from Cowscwhitz, I won't be able to forget that! Good thing I don't think they're all that anyway. You are sooooo cruel... how long are you going to make me wait?! I drive past Cowschwitz several times a year... correct me if I'm wrong, but there's an In n' Out at the next stop!! Majority of the times I eat the grilled cheese animal style but now knowing about cowschwitz, i think I will always be eating grilled cheese. I didn't realize u were a vegetarian all this time. Hi Rashmi: I'm not a vegetarian, but I don't eat much meat. Am a flexitarian.